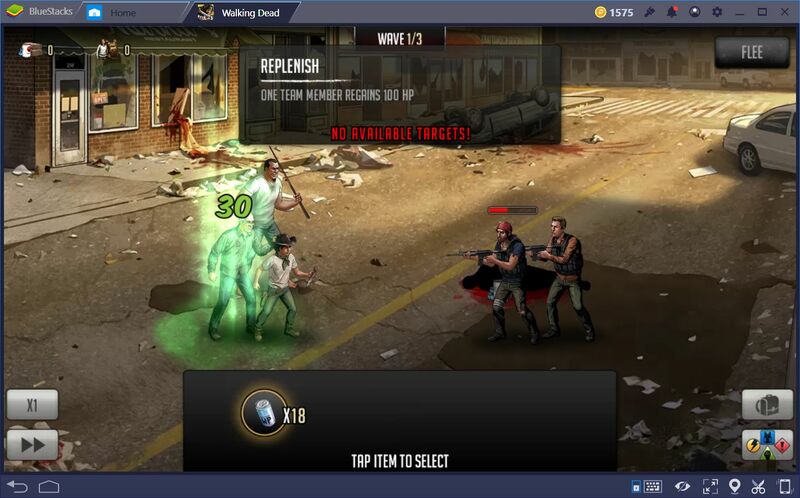 A few moments after beginning in The Walking Dead: Road to Survival, you will gain access to the workshop. 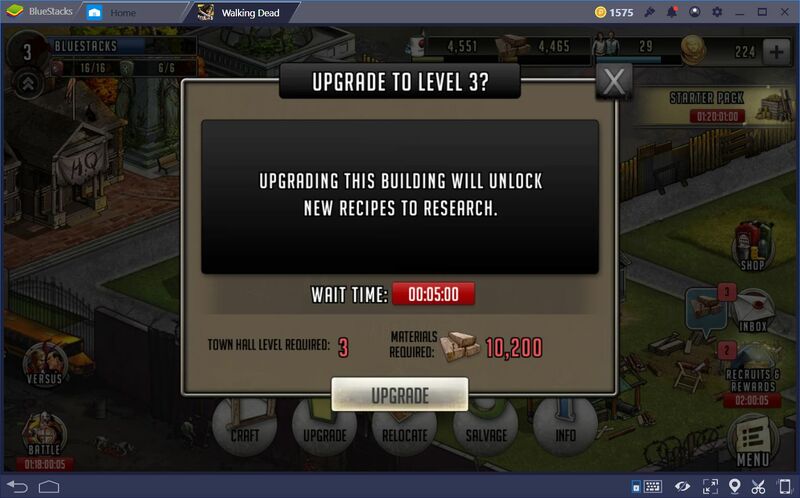 Right off the bat, we could tell that this building would be extremely useful down the line, considering that this is the only place where you can craft battle items for use against the hordes of walkers and gangs of outlaws. However, not all items are as useful as others. For instance, the very first combat item that becomes available is the Replenish, which heals 100 points of damage to any of your characters. This item is exceedingly important at the start as you will need all the tools at your disposal in order to stay alive. Luckily, you can bring up to 20 of these on each mission and, since they are easy to craft, they will be your primary source of healing, aside from the Adrenaline Rush of any healers in your crew. 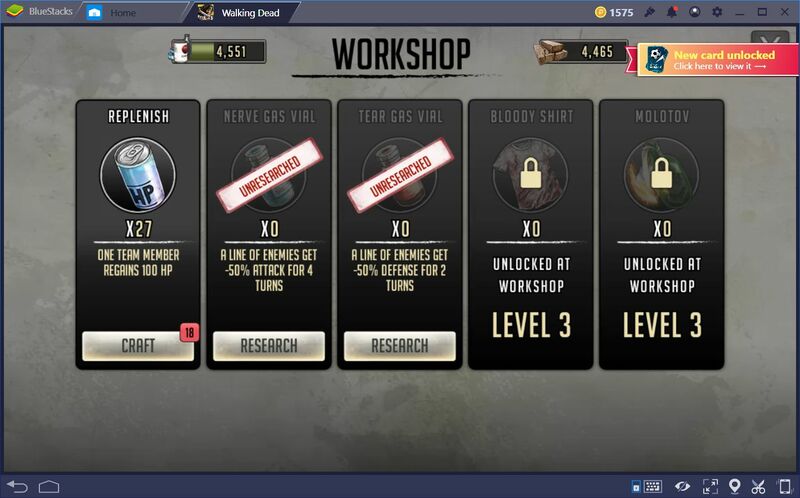 Due to its importance, knowing when to upgrade the workshop will become an important part of your gameplay experience, as some levels will unlock items that are not as useful as others, while in others you will unlock exceedingly important items. 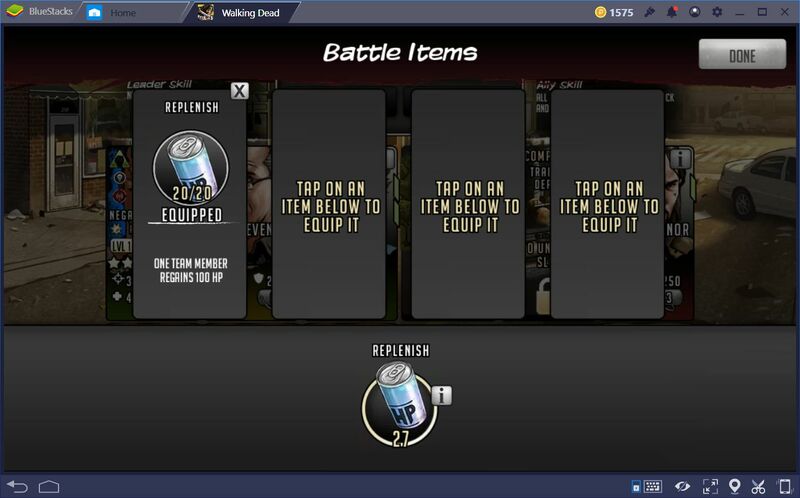 In this guide, we will create a list of all the items you can make in your workshop, as well as other tidbits of information to keep in mind when upgrading this building. Furthermore, we will also give a brief explanation of what each item does so you can make the best upgrading decision to meet your needs. In this section, we will give a brief description of the items that, in our opinion, are the most important in the game. Replenish: As we mentioned already, this item is exceedingly important for staying alive in the beginning, especially since you have no means of reviving fallen characters early on. Heals 100 points of damage to any character. You can take up to 20 of these per stage. 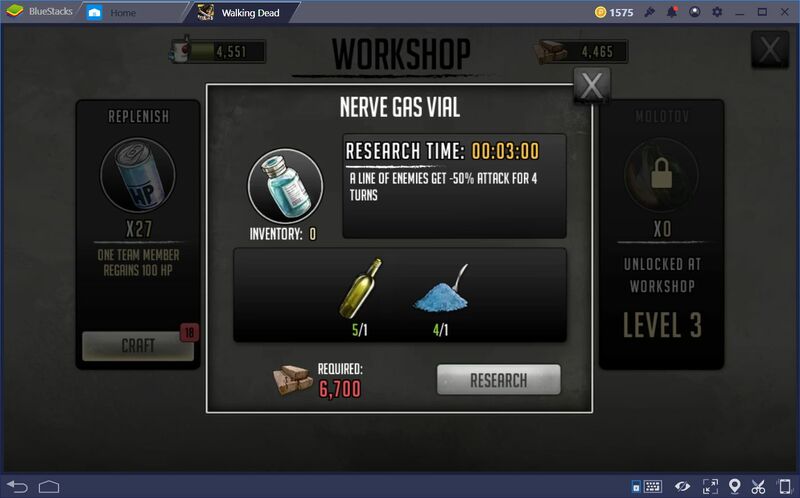 Tear Gas and Nerve Gas: These are both very cheap to make and can help to cripple a line of enemies for 2 turns. Reduces the defense and attack of enemies by 50%, respectively. Best used when walkers are forced into a single line due to obstructions in the field. You can take up to 10 of each per stage. Molotov: Deals 100 damage to a line of enemies. Could be good, except the damage is really not that great. You’re better off waiting until you have access to grenades, where the real damage is at. You can take up to 10 of these per stage. Bloody Shirt: Only effective against walkers. Can be used to give camouflage to one character for 3 turns. You can take up to 10 of these per stage. First Aid Kit: Awesome for those fights where enemies deal area damage. Heals 70 points of HP to all characters. DumDum Bullets and Grindstones: Increases the damage of all ranged and melee characters, respectively, by 50% for 2 turns. Great for use in tandem with an Adrenaline Rush that also boosts damage. You can take up to 5 of these per stage. AP Mine: Does 50 damage to a line of enemies, and leaves them with a bleeding effect that deals 60 damage per turn, for 5 turns. Great for enemies that have high HP. You can take up to 5 of these per stage. Muscle and Stamina Boosters: Increases the defense of all melee and ranged characters, respectively, by 50% for 2 turns. You can take up to 5 of each per stage. Knockout Gas: A single enemy is impaired for 3 turns. Great for disabling a dangerous enemy for several turns while you deal with its cohorts. You can take up to 5 of these per stage. Black Coffee: Heals a unit from impair and stun. You can take up to 5 of these per stage. Nitric Oxide and Sharpshooter: Increase the critical hit chance of melee and ranged characters, respectively, by 20% for 3 turns. 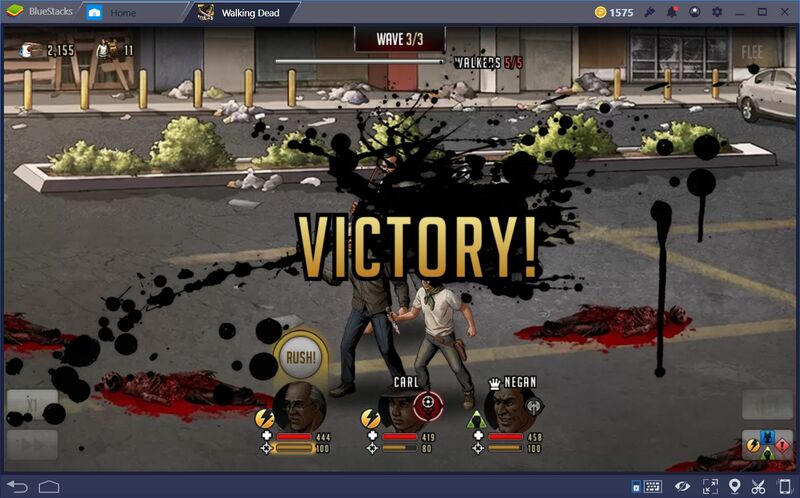 Amazing against walkers since they are instantly killed by any critical hit. You can take up to 5 of each per stage. Smelling Salts: Another item of the utmost importance. It can be used to revive any fallen character with 50% of their maximum HP. You can only take 3 of these per stage. Use them wisely. High Replenish: The advanced version of the first item you unlock in the game. Restores 250 HP to any character. You can take up to 10 of these per stage. Lemon Juice: Similar to black coffee. Cure stun and impair from all party members, and also heals them for 100 HP. You can up to 5 of these per stage. Flashbang: Stuns a line of enemies for 1 turn. Is rendered somewhat obsolete after unlocking the grenade since it’s better to kill enemies than stun them in most cases. You can take up to 5 of these per stage. First Aid Case: Arguably to best healing item in the game. Restores 300 points of HP to all characters. You can take up to 5 of these per stage. Guts: Bestows camouflage to all team members for 1 turn. Only works against walkers, but can save you in a pinch if you’re surrounded. You can only take 2 of these per stage. Grenade: The big guns. Deals a whopping 600 damage to a group of enemies. You can only take 5 of these, even though you’ll hardly need as many. Deluxe Replenish: The most cost-effective healing item in the game. Heals a party member for 500 HP. You can only take 5 of these per stage. Nerve Gas Grenade: Deals an amazing 450 points of damage, and lowers the attack of a group of enemies by 50% for 3 turns. You take up to 5 of these per stage. Tear Gas Grenade: Deals 150 damage, and lowers the defense of a group of enemies by 50% for 3 turns. You can take up to 5 of these per stage. Elegant Incense: The Lifesaver. Revives all party members with 50% of their maximum HP. Like smelling salts, you can only take 3 of these per stage. These are all the items that you find in the game. With this list, you can now decide how best to proceed when upgrading your workshop, and whether the next tier is worth it, or if you’re better off holding out until later.